Owned by Zayat Stables and trained by the legendary Bob Baffert, American Pharoah and jockey Victor Espinoza fought hard for their win in the Kentucky Derby. Two weeks later in a downpour on a sloppy track, they again persevered and won the Preakness Stakes by seven lengths. Three weeks later, American Pharoah was ready to run in the Belmont Stakes with Espinoza again in the saddle. The longest of the Triple Crown races at 1.5 miles long, the previous 37 years had seen 13 Triple Crown hopefuls fall short. Ignoring history, American Pharoah ran a seemingly effortless race, leading from the beginning and winning by 5.5 lengths. A champion of champions, American Pharoah made his own history to become the nation's 12th Triple Crown winner! American Pharoah went on to clinch the prestigious Breeder's Cup Classic in October, and earned the 2015 Eclipse Award for both Horse of the Year and Champion Three Year Old! He was also honored as the World's Best Racehorse in 2015 with a rating of 134. 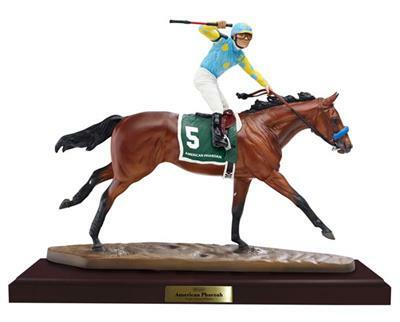 Breyer Animal Creations is proud to present triple crown winner American Pharoah with this breathtaking resin sculpture. Showcasing his powerful extended stride and keen expression, Breyer's American Pharoah is a study in excellence. With jockey in triumphant fist pump, this American Pharoah sculpture highlights the pinnacle of success and athletic achievement. Sculpted by the talented Kristina Lucas-Francis, every detail of victory is captured in lifelike realism, from flared nostrils to rippling musculature to the regal way he carries himself. This remarkable piece honors American Pharoah's historic and extraordinary accomplishment! Skillful hand-painting highlights such authentic details as the stallion's subtle star, beautifully shaded rich bay coat, and the Zayat Stables' distinctive colorful silks. American Pharoah comes complete with a hardwood base with a brass title plaque, as well as a genuine Breyer certificate of authenticity. The sculpture measures 13" long and 10" high. 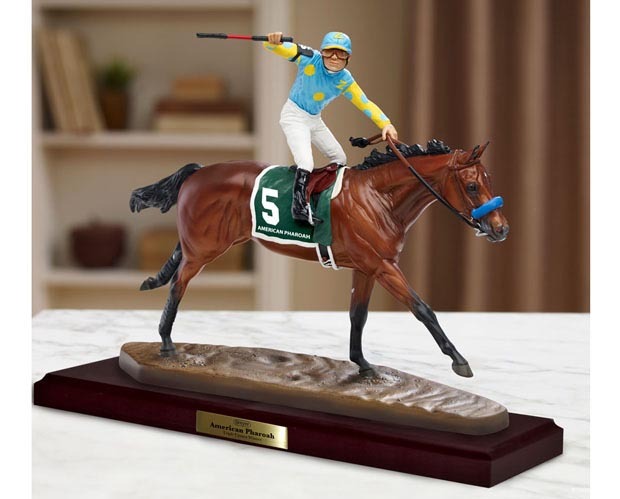 Breyer's American Pharoah Resin Model #9180 is IN STOCK at Jack's Country Store. Stablemates size of the 2015 Triple Crown Winner - American Pharoah!! NOW IN STOCK! !A champion of champions, American Pharaoh made his own history to become the nation's 12th Triple Crown winner. Traditional Size Breyer Model Horse. Even today, Big Reds star power still shines bright!